The Lower Rio Grande Valley of Texas is one of the most exciting localities in the United States for butterflying. This is because many of the species that are resident in the Valley are essentially tropical and are rarely, if ever, found in other areas of the United States. In addition, there is always the possibility of sighting one of the rare strays from Mexico. Late October is an ideal time to visit this area. The weather is usually comfortable, without the extreme heat and humidity of the summer months. Butterfly populations have had a chance to build up over the summer and many Mexican species will have dispersed northward toward the United States border. This is the best time of the year to find these rarities. In addition, the Eupatorium will be blooming. The flowers of Eupatorium odoratum are irresistible to butterflies and attract them from over a wide area. Our strategy is to Scoop the Eupes for efficient butterflying. The trip begins at 7 PM on Friday night in McAllen, Texas. We will use a comfortable hotel in McAllen as our base for the entire trip. This will enable us to easily reach all of the prime butterflying areas without having to change accommodations. We intend to visit most, if not all, of the areas described below. On the first Saturday we will participate in the NABA Butterfly Park-Bentsen State Park Seasonal Butterfly Count. We will remain flexible as to the exact order we visit localities and the amount of time spent at each in order to take best advantage of hot spots and to enable us to work with weather conditions, not against them. Butterflies are more unpredictable than birds. Exactly where and when populations will appear is highly dependent upon local environmental and climatic conditions. The uncertainty heightens our excitement. Located about thirty miles northeast of Brownsville, this vast refuge provides an unequalled panorama of the Texas coast. At this time of year, the park may also be filled with copious quantities of blooming Eupatorium and Lantana. Besides being wildly attractive to butterflies, these flowers create a beautiful spectacle all their own. We will search for coastal butterflies that we are unlikely to see elsewhere, such as Great Southern White and Obscure Skipper. The butterfly gardens around the park headquarters almost always yield some exceptional species. A Mexican Silverspot was seen here not that long ago. We probably won't be able to resist stealing a look at some of the possible birds such as Roseate Spoonbills, Sandhill Cranes and Aplomado Falcons. is also a prime location for some of the harder to find Rio Grande Valley endemics. butterflies/day at this park alone. While there is no guarantee that we will do that well this year, this is always an exhilarating destination. Six species of longtails can be found here, including White-striped and Brown Longtails. 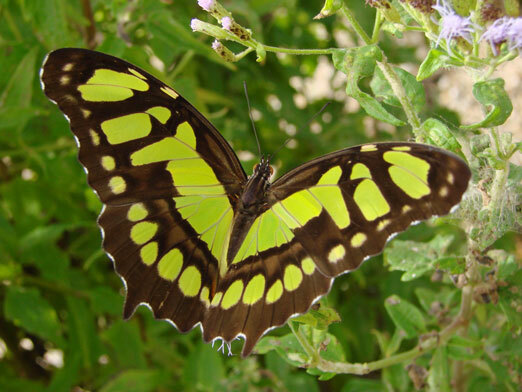 Common Mestra, Florida Purplewing, Mexican Bluewing, Malachite, Gray Cracker, Fatal Metalmark, Purple-washed Skipper and the electrifying Guava Skipper are just a few of the many other tantalizing possibilities. The list of rare Mexican strays, such as Common Banner and Guatemalan Cracker, that have been found at Santa Ana is huge! The dry, thorny brush of this area provides different habitat than we have visited so far. Some of the species we will search for are Erichson's White-Skipper, Desert Checkered-Skipper, Red-crescent Scrub-Hairstreak, Silver-banded Hairstreak and 'Dark' Tropical Buckeye. What will eventually be the largest dedicated butterfly “garden” in the world, featuring plants native to the Lower Rio Grande Valley, the 100 acre National Butterfly Center is already one of the premier hotspots for rarities, including the first United States records for Cross-barred White (Itaballia demophile), Four-spotted Sailor (Dynamine postverta ) for Turquoise Longtail (Urbanus evona), for Broad-tipped Clearwing (Pteronymia cotytto) and for One-spotted Prepona (Archaeoprepona demophon). The list of species seen here is over 220 – and rapidly growing! In previous years we have located some special areas near the city of Roma. Here, the dry scrub is punctuated by bursts of more tropical vegetation. We have been fortunate to see Ruby-spotted Swallowtail, Falcate Metalmark, Crimson Patch, Theona Checkerspot, Red Rim, Silver Emperor, Tropical Leafwing, Zilpa Longtail, and Gold-spotted Aguna at these locations. The Western end of the Lower Rio Grande Valley is an exciting area. Looking across the border into Mexico one can see the Sierra de Picachos, a 4000 ft. high mountain range, clothed in pine-oak, that is only 45 miles away. The newly created butterfly garden at Falcon State Park is a great place to search for the many Mexican species that only need to fly the short distance from the Picachos! The trip ends at 9 AM on the Saturday morning of the ninth day, in McAllen, Texas. Leader will be Jeffrey Glassberg, president of the North American Butterfly Association and author of Butterflies through Binoculars and A Swift Guide to the Butterflies of Mexico and Central America. Cost of the trip is TBD/person from McAllen. Cost includes double-based accommodations, all meals (except, because of staggered arrival times, dinner the first night) and soft drinks, ground transportation, airport transfers, tour leader fees and entrance fees. Not included are alcoholic beverages, laundry services, and other items of a personal nature. Single supplement is TBD. This trip is limited to 8 participants.